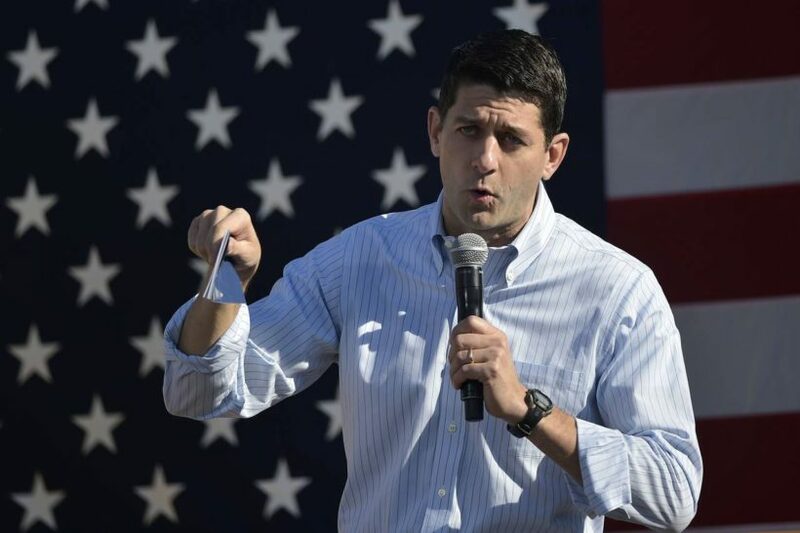 (by Mark Z. Barabak and Lisa Mascaro, Los Angeles Times) – With election day less than a month off, Republicans faced an extraordinary breach in party ranks Monday as House Speaker Paul Ryan declared he would no longer defend presidential nominee Donald Trump and instead focus on preserving the GOP’s majority in Congress. Without formally withdrawing his endorsement, Ryan nonetheless delivered a stinging blow to Trump, urging Republican lawmakers in a conference call to do whatever they needed to win Nov. 8 — even if it meant cutting loose from the party’s [presidential nominee]. Ryan’s statements drew an immediate backlash, on Capitol Hill and at the party’s grass roots, as loyalists were stunned the top elected Republican in the country would abandon Trump at a time party leaders would normally be ramping up efforts to take back the White House. Trump responded…on Twitter. “Paul Ryan should spend more time on balancing the budget, jobs and illegal immigration and not waste his time on fighting Republican nominee,” Trump wrote. “What’s going on is our leadership panicked when there was a massive disclosure of a private conversation that Trump had 11 years ago in which he was grotesquely sexual and egotistical,” said Rep. Dana Rohrabacher of Huntington Beach, California, who called Ryan’s move cowardly. “For us to try to undo what the Republican voters did [selecting Trump as the nominee] in the primaries would be a betrayal to the Republican voters who made their choice,” Rohrabacher said. Seeking to clamp down on speculation that the Republican National Committee was also primed to walk away from Trump, Chairman Reince Priebus told members the organization would continue to stand behind and work on behalf of the nominee through its “Victory” program, which aims to boost Republicans up and down the ticket. The get-out-the-vote support is crucial to Trump, who has ignored fundamentals of campaign building and is counting almost entirely on the RNC and local parties to register voters and ensure they cast their ballots. Democrats could retake control of the Senate if Clinton is elected and they gain four seats…. (Her vice presidential running mate, Tim Kaine, would be positioned to break a 50-50 tie.) If Trump is elected, Democrats would need to gain five seats. Dozens of party leaders and elected officials either rescinded their endorsement of Trump or said they would not vote for him after the vulgar video surfaced. At Sunday night’s debate, Trump apologized for his remarks and characterized them as “locker room” talk that belied his true feelings. Ryan cut his ties to Trump in a Monday morning conference call with GOP lawmakers, telling Republicans they should “do what’s best for you in your district,” according to a participant who was granted anonymity to discuss the private session. 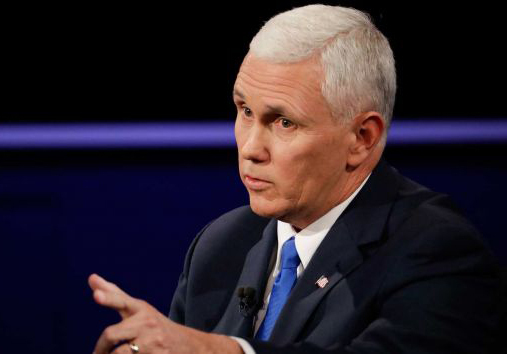 Donald Trump’s running mate, Republican nominee for vice president, Mike Pence. Making the rounds on cable TV, Pence insisted he was fully behind Trump after initially refusing to defend his [offensive] comments. … Gary Burgess, a 65-year-old engineer, who came to see Pence at a rally in Charlotte, N.C., said those walking away from Trump were putting their own interests first. 2. How do the Los Angeles Times’ reporters describe the reaction of Republican supporters of Donald Trump? 3. What statement did Donald Trump make via Twitter in response to Speaker Ryan’s remarks? 4. a) How did some of the Republican lawmakers in on the call respond to Speaker Ryan’s decision? b) What do you think of Rep. Rohrabacher and Cramer’s respective comments? 5. How do the reporters describe the decision Republican lawmakers have to make? 6. a) It appears the majority of Donald Trump’s supporters (the Republican voters who support him) have not pulled their support after offensive, vulgar remarks he made in 2005 were made public. But as a leader in the Republican party, Speaker Ryan did. As the leader, did he do the right thing? Explain your answer. b) In the 2016 elections, 34 of the 100 Senate seats are up for election, as are all 435 congressional seats. Would withdrawing support for Republican presidential nominee Donald Trump make you more or less likely to vote for your representatives who did so? Explain your answer. Is this a reasonable assertion? Explain your answer. Is this an accurate description? Do an internet search to determine how many times Republican and/or Democratic party leaders pulled their support for their party’s presidential nominee. Does Ryan’s move have any precedent? Those who complain about vulgarity and lewdness by entertainers or athletes are mocked for being uptight or judgmental. Fifty Shades of Grey is the most successful R-rated movie of all time. The book sold over 125 million copies worldwide. Game of Thrones won more Emmys than any primetime TV show ever. The show won 12 Emmys this year. President Obama is even a fan of the show. Many of those offended by Donald Trump’s comments from 11 years ago watch and accept immorality, violence, vulgarity etc. from the entertainment industry. What are your thoughts about this contradiction?